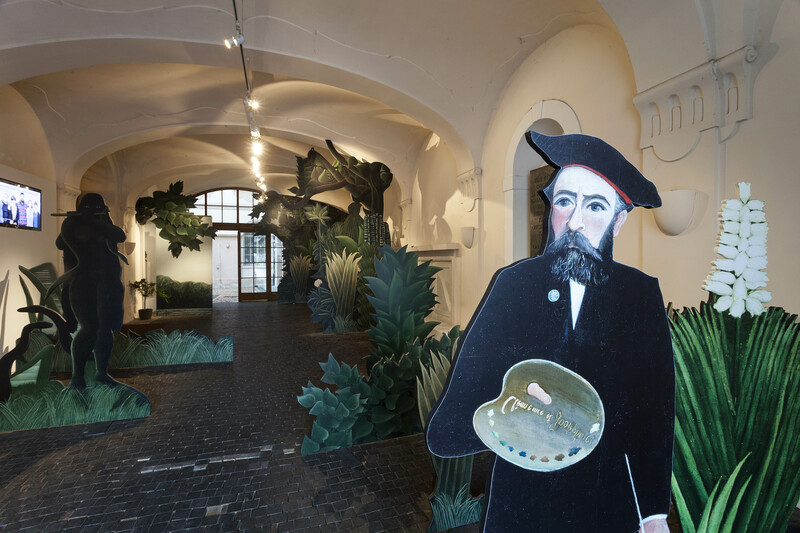 The works of Henri Rousseau (1844-1910), one of the most significant artists of the 19th and 20th century, whose nickname was “Le Douanier,” are currently being exhibited at the Kinský Palace in Prague. This exhibition, called “Douanier Rousseau: Painter’s Paradise Lost,” has made its third stop in Prague after Venice and Paris, in cooperation with the Musée d’Orsay in Paris. The exhibition displays works of other artists of that and later time, such as Paul Cezanne, Pablo Picasso, or Frida Kahlo, who shared and resolved similar artistic concerns together, and who held a deep respect and admiration for Rousseau, even though he was derided by contemporary critics for his ‘amateurish’ techniques and odd formation. There are many unclear stories about Rousseau’s earlier career activities and his nickname “Le Douanier,” which means “customs officer.” However, rather than being an actual customs officer, he worked at the Paris Customs Office as a clerk for 24 years. After an early retirement in 1893, he was able to focus on his paintings full-time. He created his own world of art as a naive artist, depicting spiritual and primeval aesthetic environments. By viewing his works in person, one can easily detect the unusual proportions of the subjects, the unnatural perspectives, and other features that show Rousseau’s characteristics as a self-taught artist. Also, it is quite surprising that the Douanier never left France during his lifetime, but was able to visualize the energy and spirits of raw, primitive environments. He got most of his inspiration from the zoos and botanical gardens of Paris. “When I go into the glass houses and I see the strange plants of exotic lands, it seems to me that I enter a dream,” he once told a journalist about his regular visits to the Jardin des Plantes. Perhaps that is the reason why the works of Rousseau give us a sense of mysteriousness, but also a very unique vigor that can’t be seen in the works of other artists of that time. “The Snake Charmer” (1907), placed in the room at the very end of the exhibition, emits surreal, exotic energy, and seems to almost silence all the noise of one’s surroundings. The dark, backlit figure of a woman, with her eyes glowing in the shadow, reflects the unique dreamlike drawing style of Rousseau. Clear, distinct outlines, deep colors and a bold composition make the work more “Rousseau.” The charmer seems to bewilder the snakes and the other animals, creating a hypnotic, mysterious atmosphere. This unique impression actually tells us that it is not a landscape painting, but an illustration of Rousseau’s subconsciousness and imagination. You can see this also in Rousseau’s other exhibited works; they are emitting a bizarre and intense energy, as in “Child with a Doll” (1906), where the proportions and the subject’s facial expression look strange and unconventional. Rousseau was undeniably a bold artist. Despite the fact that the critics mocked his works, he continued to express his own “modern style,” as he described it himself. Instead of depicting the affluence and splendor of La Belle Époque, or the beauty of perfect proportions, he continued believing in his drawings and paintings. This exhibition is a unique opportunity to feel Rousseau’s innocent yet audacious energy, as well as see his astonishing talent and fantastical imagination in an ordinary environment. Above all, you can experience the solid faith and confidence of Rousseau’s works. The exhibition is open until January 15, 2017 at the Kinský Palace on the Old Town Square. You can learn more on the National Gallery’s website. Photo courtesy of the National Gallery.